Riot is a popular instant messaging Client that uses Matrix service. In this example we use Riot as matrix client for bridging Matrix and Telegram rooms. Matrix is about bridging altogether and many bridges for many services like IRC, Slack, Twitter, etc. are available. You can use ‘Manage Integrations’ option from Riot to use this feature. Today we are talking about bridging Matrix and Telegram rooms. In order for bridging Matrix and Telegram rooms we use telematrix bridge. But telebridge is not available in all homeservers. In the following example, we’re using the tchncs.de matrix instance as our homeserver for bridging Matrix and Telegram rooms. It would work with any homeserver the same way if they are providing a telematrix bridge. So first you need to take an account in this server. The beauty of matrix is the ability to choose custom server. If we have enough technical knowledge, we can setup our own server to use this service. And we can write code to do any additional integration we need. Create a Matrix ID in tchncs.de custom server. 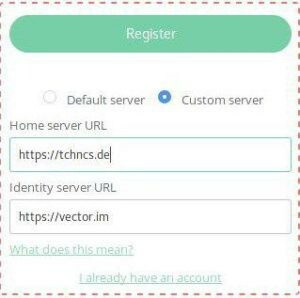 To do this select custom server from login window and fill https://tchncs.de in Home server URL field. Open Settings->addresses in the Riot room which you need to bridge. Then add the alias got from Telegram in the Local addresses for this room field. 4 . Make sure that the option in Settings-> WHO CAN ACCESS THIS ROOM? must be either Anyone who knows the room’s link, apart from guests or Anyone who knows the room’s link, including guests. Wow! The process of bridging Matrix and Telegram rooms is completed. You can now read Telegram group messages in Matrix/Riot rooms and vice versa. The bridging service is available to any matrix servers. The custom server is only needed to connect the services.